I want to start by saying I’m not trying to sell you anything. I’m going to mention some of my online businesses but I’m just wanting to share my business journey. I’m sure you’ve seen these stories and feeds popping up all over the internet and particularly in social media. I may get targeted for these types of feeds more as I am a new mother so they may be encouraging entrepreneurs as the thought of going back to work is quite horrible when you’ve been on maternity leave. I must say, YES! I’d love to work from home, spend lots of time with my family and have an income supporting my family so I can provide for their financial needs. I already have a successful career. I am a secondary school Science teacher. I enjoy working with young people and inspiring them to be the best they can be. Young people are themselves inspiring… even the naughty ones (every child is special). Unfortunately, there is too much interference from the government for what is required in teaching now and it is making doing the job much much more difficult than it should be. Despite loving the teaching aspect (which includes marking and feedback), the other unseen aspects are becoming a destructive force in my life and I’m struggling to see how I can continue in the profession and remain whole as a person. I need to be mildly happy at work so that I can come home and be the best mother and wife that I can be. I have achieved quite a lot in my chosen career and as such I have a healthy level of self belief. Whatever I do, I work hard and do it well. It’s this self belief that leads me to believe that if I focus my energy into my own business, I could actually do quite well. One thing I firmly believe though, even though I want to leave teaching, I shouldn’t start a business as an escape plan, I should start a business because I want to work in that industry. Otherwise I would not have the passion to make it a success. I need to be driven by positive energy rather than negative thoughts. Convincing my parents (who have stuck to the same job their entire lives) and others that this is a good thing for me I’ve found to be challenging. Why should I work so hard to have a successful career only to walk away from it. I must be mad or just unable to cope with working (so just give up and be a housewife). I can tell you this instant… I know myself well enough to know that I’m not suited to being a housewife. I have friends who do that job and I admire them for how amazing they are at making a home but I just know that I need to do something else for me to be fullfilled. I am also passionate that I want to generate an income. There is a secret competitive part of me that wants to make more money than my husband who is also had a successful career. I don’t think he minds this idea (he’d rather that be my passion than buying expensive handbags for instance). So what should I do? Well I’ve actually got a few things that I am trialling. 1. Artwork – I’m an artist that produces simple drawings. They tend to be based on childhood memories or my favourite films. I have a website www.adelemary.com where I can sell my artwork but to be honest, after I set this up I realised that I enjoy art as a hobby and making a business out of it would drain me creatively. So I’m happy to keep making artwork and selling it online, but I’m not bothered about becoming the next Damon Hurst. 2. Doughnuts! – I am a registered food producer and I make gormet doughnuts for sale at local farmers markets. I’ve called the brand Punk Doughnut. I don’t have a website as I’m promoting on Facebook, instagram and twitter. I set this up during my pregnancy and I’ve really enjoyed it. Designing a product, making it and selling it to a customer who enjoys it has been extremely fulfilling. The only problem is there has been a bit of investment at the start and I’m quite heavily pregnant at the moment so I’ve had to put a pin in the business as I’m not physically able to transport and sell the doughnuts as I’ve had some complications. I also realise that I am not going to be able to do any business whilst I am a new mummy again as I’ll be focusing on my newborn. 3. My latest interest has been dropshipping. There are many industries which offer drop shipping and the idea is quite simple. I sell a product through my own website or through an online market place such as Amazon or EBay, when an order is placed I send the order to my dropshipper who sends the order out to my customer. I can set the price I want to sell the product for and I pay the wholesale price from my dropshipper. The difference is my profit. Sounds like a no brainier. I looked into various different industries to focus on and as I’m rather interested in home decor I favoured home decor and furnishings, including gifts. I set up an Amazon seller account (which is very simple) and uploaded some listings to get selling. a. The Amazon fees will take up the majority of your profit margin making it difficult to find products that you can sell competivitly. b. Many dropshipping companies charge you for an account. I think this is because a lot of people are trying dropshipping and there will be many people that dabble in the industry and just give up. I completely understand this. I’m not at a stage where I’m confident with my market to commit to one of these companies. c. Amazon require EAN numbers (basically official barcodes). Every product needs one and not all dropship companies provide them. You can buy EAN numbers from Amazon or other online shops from about £1 per number. If you want to sell lots of products on Amazon this cost will add up and also eat into that already narrow profit margin, reducing your viable products even further. d. You will get a lot of traffic to your products as Amazon is a go to place for many people these days. This means you are more likely to be seen if you sell through Amazon. However, there are many other sellers selling the same product and unless you are selling at the lowest price you are unlikely to get a sale. This means prices are competitive and you are going to reduce that profit margin even more… this means even fewer viable products. e. Remember you don’t hold any stock. It’s good because you don’t have to invest anything upfront. This means you have to keep informed about stock levels from all your drop shippers so if a customer orders something through this your Amazon shop then you should be able to fulfil the order. If you have issues with fulfilling orders then you can have your account suspended. Some dropshipping companies provide to many sellers like you as well as wholesale customers, so popular items are likely to go out of stock quickly and unless you are able to manage stock levels from multiple suppliers you can get into a sticky situation with your shop… fast. It is for this reason that dropshipping sellers have a bit of a bad name on some forums as people setup their Amazon/EBAy shops without much thought about stock management and upset potential return customers for those products. I have started small so that I can learn how best to manage my stock. I am trying to be responsibile but this means I have fewer products on sale than I would like to. f. The companies who offer dropshipping and have the most desirable products tend not to trade with Amazon/EBay only sellers. These “more desirable” companies tend to offer products with a more attractive profit margin and/or higher end goods. If you sell only on Amazon you’ll need to sell from other companies who already supply to Amazon resellers and are competing with you on price… goodbye more profits. g. When you google dropshipping you will get lots of people saying how easy it is to get set up and there are pros and cons for selling on Amazon/EBay. Most people will say, make it on your own. I have come to to conclusion that this is the best course of action for newbies too. Even though it will be more difficult to drive traffic to my site and get that sale, I haven’t enjoyed the faceless, brandless selling on Amazon. I mentioned earlier that when I do something I want to do it well. If I’m going to sell something I want to develop a brand and market identity. This is so important for any business. Im going to expand my art website to include orher home decor products and develop and drive my own brand. It will take more time and it will be harder work as I will need to make improvements to my website to allow me to sell these products but I’m not interested in doing things the easy way. I want to do things the right way. Success doesn’t come easily which is what I think a lot of these “work from home and earn an income” make it sound like. This is just my personal reflection. I’m at the start of my business journey at the moment. I’ll hopefully be posting more about my successes in the future. I am enjoying the learning process so even if I have some setbacks, I’m happy that I’m learning as I will be a success in the end. If you’re thinking of setting up your own business I hope you’ve found my comments useful. There are many avenues for business out there and I wish you the best of luck. Many moons ago (2004) I purchased a voice activated remote control for my then boyfriend (now husband). It was pricy and don’t work very well. It seems that now we have finally reached the time when we can now start to integrate these devices in our lives without getting too frustrated. I don’t really use voice activation on my phone so I guess my starting point was the Xbox one. Turning my whole to system on using just my voice has become common place now. I still get frustrated using voice activation to go through the menus but that’s fine. My 21 month old now says “Xbox” whenever he sees a tv screen. One day it will start recognising his voice… then I’ll be sorry. We’ve had the Xbox for a couple of years and thenaround November last year we introduced Alexa into our house (the Amazon echo). I thought it would be a novelty that would just wear off but I’m actually quite liking it. I tell her to add items to my shopping list as I’m cooking and run out of ingredients and she does! (It’s the small things that make me happy). She tells me stories and jokes: I’ve not been brace enough to make a purchase using her yet though. Within 2 months of having Alexa we started to look at more home automation technology. We now have Philips Hue bulbs in our living room, kitchen, hallway and bedroom. You need a Hue bridge for this as well but it’s easy to install. Now I can control my lights by just asking Alexa. My son is amazed… he’s going to have some fun when he can speak properly. I’ve set up extra themes to suit what I want from my lighting. In the living room we have spotlights and lamps. We have dimmed red lighting for cinema theme, ambient yellows for chillout theme and then some practical themes such as “ironing” which lights the spotlights where I iron but leaves the rest of the lights dimmed for someone else to chill and watch TV at the same time. I also have my guitar a practice spotlight that serves the same purpose. Along with the basic bulbs and bridge we have a motion sensor set up in our hallway. There is only one switch for the light and you need to walk to the other end of the hallway to turn it on. Now the light will turn on when it detects someone walking down which is great! In the bedroom we have Hue lamps and a programmable switch. The settings give us reading lights, on, off and toilet lights. The toilet lights give us dimmed red lighting for going to he loo in the night. It means we can keep our night vision and not be woken up by bright lights. I’m also expecting my next baby in s couple of months so this setting is going to be great for those night feeds. I always thought that his type of technology would never catch on but having experienced it I don’t think I’d like to go back. It’s not necessarily the voice activation that I like as much as how customisable he whole system is to making my home that bit more “mine”. If you are thinking about home automation, the Philips Hue system has been great for us. Im thinking about doing some YouTube demos of how we have our lighting. Let me know if you’d be interested in this. Mum just happy my home is becoming more homely for me and my family. I just need to plan an occasion to use my disco lights now. I just can’t get over how compact this pushchair/stroller is. I have had 2 different cars since having my first child and boot space was always important to me as with children you can never really travel light. The amount of space a pushchair takes up is enormous and incredibly inconvenient. Whether is a collapsible stroller that needs to be placed on top of shopping bags or a travel system that needs to be built after every car journey, there are definitely drawbacks to any choice of pushchair. The XXS stroller takes up so little space it is just great for quick trips out and about. Its easy to put up and take down and there is a generous amount of storage for a stroller under the seat. This storage will mostly be taken up with a changing bag as the stroller is so lightweight I wouldn’t trust it to hold my enormous bag on the back. Luckily though I have a little changing pod bag for travelling light with this stroller. I have a second child on the way now, otherwise this would have been my choice of stroller for going on holiday (flying). I know you don’t really get restrictions on the size and weight of your stroller but I might have tried to get this one though in hand luggage so that I always had it from the gate and some airlines do that but others make you go to oversized baggage. When the next baby arrives this compact stroller is going to grans. She doesn’t have much space at her house and I know she’ll love taking George out on little trips along the canal to give him some quality time. The only drawbacks to this stroller are that it can’t lie flat so if little bubba needs a nap it’s not the best stroller. Also although there is a sun shade I never had a rain cover so it’s only a sunny day stroller and I never really had the confidence to have it as my sole pushchair. Maybe when the babies are older and rarely need the pushchair but I’m not in a position to judge that just yet. Here is a link to the stroller on mothercare (it’s a mothercare exclusive) in case you were interested in having a look. Sundays can easily slip away from me. I try to get the house in order for the coming week but if I’m not careful, the time zooms by and I’m left thinking I’ve not really achieved much. Today started out slightly differently. Last night my Son spent his first night in his toddler bed. I was half expecting him to be up in the night running around or doing the same at the crack of dawn. He didn’t though. He slept through and woke at his usual time. He sat up in his bed and cried for me. I was hoping he would climb out and explore his room. I guess he hasn’t figured out he can do this yet. I did manage to get the house in order in between playing during the morning hours. Outside looked fresh. It wasn’t too cold and with no rain it looked like a good day for a walk. We probably would have gone for a country hike but my pregnancy won’t allow that at the moment. We decided to go to a local park and garden instead in Matlock. I want expecting so many shops to be open in the town. We had a browse around some shops before unleashing the toddler in the park. If there is one thing I have learned today it is: puddles are great fun. Even though George isn’t old enough to jump in them yet, he made a beeline for every puddle in sight and pottered through them. He loves his independence and it was so lovely to just watch him enjoying being free to walk around. He doesn’t like to hold hands, he is always suspicious that he will be held back… he’s right. There is duck pond near the play park and he chuckled as he shouted “duck”. It was one of his first words as my mum walk take his down to the local canal as a baby to feed the ducks. I thought the park would be too big for him but there was a great climbing frame that he was able to decsend on his own to climb up to a large slide. I think we could still be there now if it was up to George: he loved it. That and running in and around the other fixtures. The park was really clean and had a soft rubbery floor around most of the fixtures so even when George did stumble he stayed relatively clean. There is also a paddling pool in the park which we didn’t venture into today but I’m certainly looking forward to returning in the warmer months. It’s little outings like this that make me so grateful for being a parent. It’s also times like this that make me feel like I’m being a good parent; my husband too. It’s the simple things that make us happy. I hope you have had a beautiful day. I love having a hamster for a pet. Po is so adorable and loving. He loves cuddles and coming out to play. The only problem is, when you look around at the hamster cage market you find a range of cages that go from quite dull and boring to something straight out of a Roald Dahl book. Po was bought just before my husband and I went into nesting mode for our new baby. During nesting we redecorated the entire house. We tore down walls and ceilings, it wasn’t just a paint job! After all the redecoration we were struggling to find a place in our living room for our hamster cage. Omlet came to the rescue. There are a few colour options but we went for the Walnut style Qute design costing £89. The colours of the unit fitted in with our decor and gave us an elevated table for a lamp. Even though it isn’t designed for a corner we placed it in one anyway and I think it looks nice. What’s great is how Po is now a feature in our living room and we can easily watch him play around. There is a handy compartment for food, bedding and a hamster ball at the bottom which fastens with a push magnetic catch. The mechanism is quite sturdy and feels good quality. It is also super easy to clean out with the sawdust tray sliding out like a dream and the cage parts can be removed easily. The wheel and water bottle are also easily removed for cleaning and filling. Sometimes Po’s little feet drop through the cage section under the water bottle which makes me feel sorry for him though. Po loves to burrow and the deep tray means that we can give him a load of shavings for bedding and because the sides are so high there is no mess thrown out on the carpet… win! Po also loves burying his food so as soon as we fill up his bowl it is enptied into various hiding places. It makes it look like we don’t feel him but we do. He is a spoilt little fur ball. 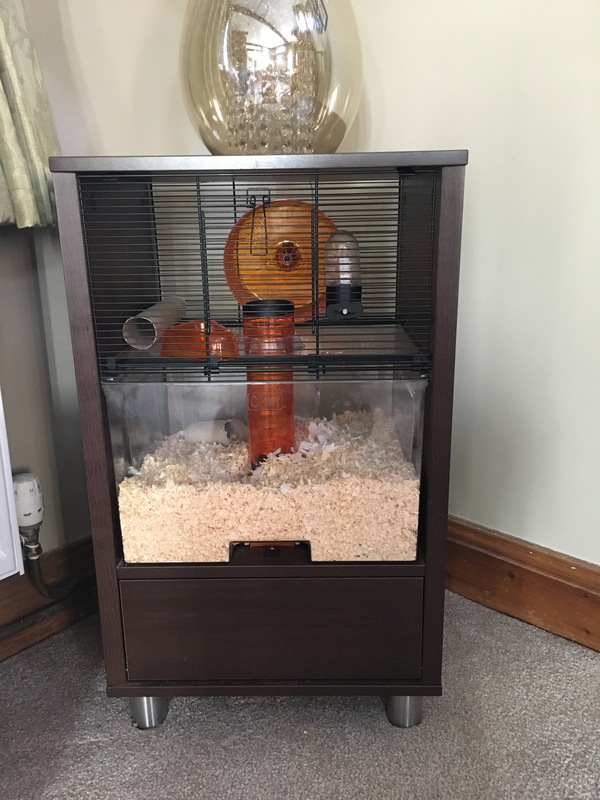 All in all I think this is a great little unit if you want to have your pet intergrated into your home. Did I mention the wheel isn’t squeaky either.. big plus. Up until now I have kept design items in my home quite minimal and basic. I like clean lines and blocks of colour. A part of me always wanted a little more opulence though. I actually went out to buy a pendant lamp for my staircase. The staircase opens out into my living room and the fixture that was there was broken by a wardrobe delivery a while ago. I decided that I wanted something more than just a plan shade and came across the Bella range in Next Home. I loved the mink coloured shade but the droplets of glass gave the shade the opulence I was looking for. Whilst shopping we came across the table lamp. As it happens the lamp has two bulbs. The top bulb is a bayonet fitting and the bulb in the base has a screw fitting. We are in the process of buying automated bulbs so the bayonet is not an issue but we are still waiting on the adapter for the base. The shade is nice and simple which I do like in a lamp. We were a little disappointed that there was a slight blemish on the shade at the front which cast a slight shadow but we have adjusted the shade so it doesn’t show at the front. I was thinking of returning the lamp but I was so excited to have it the adjustment allowed us to live with its tiny flaw. In situe the lamp looks beautiful. I think the base looks similar to a jellyfish. The photos show various different colour settings from our Hue bulbs. I’m not sure if the cabinet that my lamp sits on it too high for the lamp as it is quite tall but I love the light and patterns that it casts. Im looking forward to my pendant lamp shade arriving now.